With total amnesia, the six confused crew members give each other numbers – One to Six – deal with uncertainty over whether they can trust each other and start to work out what is going on. It doesn’t help that corrupted data banks mean they have incomplete information, and even what they have may not be 100% true. It’s a pretty nifty idea for a space western. Over Season 1, the crew began to figure out what they were doing on the ship (the Raza), with as many mysteries emerging as were solved. It appeared that they were all criminals, with terrible rap sheets including murder and assault, except, of course, that they can’t remember any of it. With their amnesia giving them the possibility of a fresh start, are they going to go along with what they believe they’ve been sent into deep space for, or are they going turn over a new leaf and start to do the ‘right’ thing? Indeed, if your mind has been wiped, are you really the same person any more? The first 13 episdodes saw the crew dealing with all manner of issues, from having a possible saboteur on board, to doppelgangers, to a secret room on the ship, all the while avoiding the Galactic Authorities and trying to find out who emptied their minds in the first place. The show is now commencing Season 2, which has now started on Syfy on Mondays at 8pm (the first episode is now available on catch-up), with 13 more episodes of deep space action and mystery. One (Marc Bendavid) The moral center of the crew, he boarded the ship under an assumed identity in order to seek revenge for his wife’s murder. Two (Melissa O’Neil) The leader of the Raza, she is fiercely protective of her crew. With the added physical and mental boost from the bioengineered nanites teeming through her system, she is a formidable opponent. Three (Anthony Lemke) His bottom line is his own well-being, but this merc with an attitude has had to learn to stand shoulder to shoulder with his crew. Four (Alex Mallari, Jr) Quiet, composed, and deadly, he has carved out his place on the ship. But as the exiled prince of an independent realm, his home world is never far from his mind. Five (Jodelle Ferland) Despite being the youngest crew member, she is definitely not to be underestimated. Her ability to adapt and survive is only matched by her tech skills, and her will to keep the crew of the Raza together. Six (Roger Cross) Six’s allegiance to the crew is thrown into question when his actions betray them to the Galactic Authority. But when his strong sense of right and wrong is turned upside down, he must search his own heart for answers. The Android (Played by: Zoie Palmer) Far from your typical android, her eagerness to fit in has helped her become an integral, albeit unique, part of the crew. Nyx (Melanie Liburd) With her killer instincts, Nyx is the physical equal to the formidable crew mates. Having spent recent years in and out of prison, she’s cautiously optimistic about finding a place to call home onboard the Raza. Devon (Shaun Sipos) Once a world class surgeon, Devon is haunted by a dark past that may pose a danger to himself and his fellow crew members. 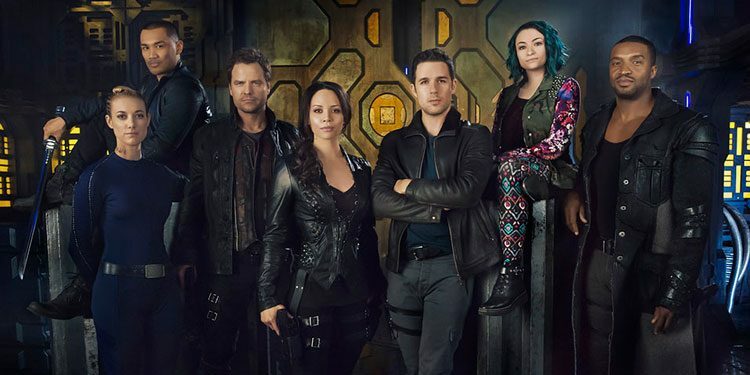 Dark Matter has been compared to the likes of Firefly and Stargate: Universe, with perhaps a dash of Lost’s mysteries thrown in for good measure. It’s also a set-up that ensures it’s a show that has to care about character and storytelling as much as sci-fi shenanigans, building up an increasingly complex, interconnected universe, which will keep you guessing. If you like a show with plenty of secrets to uncover, and where you can never be sure quite how good the good guys are, it’s well worth a look. 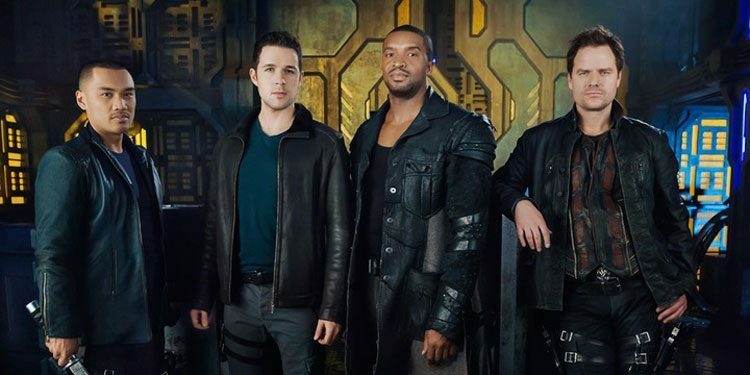 Dark Matter Season 2 in airing now on Syfy and the first episode is available on catch-up.